Until Rudy Giuliani spoke in Boro Park last week, the mayoral election was about legitimate issues. We had Mike Bloomberg running on his record, and Bill Thompson challenging him with a different vision and a lot less money. Then Rudy Giuliani came to Boro Park, trolling for the chassidic vote. His pitch sounded like a sinister block busting leaflet from the 1950's. 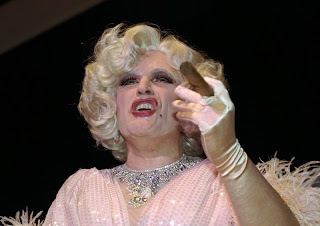 By now, Giuliani's remarks have achieved infamy. The New York Times reports as follows on his appeal to fear. I have viewed New York City from Crown Heights since1979. The fear of which Giuliani spoke predates David Dinkins. I was living in Crown Heights under Ed Koch, a vastly overrated mayor who was too busy asking "How'm I doing?" to ever do anything about crime. I was a heavy smoker back in the late 70's and early 80's. If I was out of cigarettes, I would go out at all hours to get them. And the places I bought cigarettes from were open dope shops. They were easy to recognise. The entire store had maybe four rolls of toilet paper, a can of tuna fish and three bottles of soda. Despite this, they had a stream of customers buying little brown envelopes. No one ever bothered them. Back in 82, there were muggings every Friday afternoon on the 2 train coming back to Crown Heights. (Back then it was the 2 train and not the 3) High school kids would go into the conductor's cabin, turn off the lights and pounce in wolf packs on passengers who looked like easy marks. In 30 seconds, they would rip the pockets out of your pants with the wallet. Mayor Koch was too busy asking "How'm I doing?". Israel Rosen, a chassidic Jew was beaten to death in 1989, around the same time Michael Griffith was killed in Howard Beach. He had a couple hundred dollars that was untouched. But it was not declared a bias incident. Ed Koch had nothing to say to the Jews of Crown Heights other than "How'm I doing?" Dinkins was mostly a continuation of the do nothing attitude of Ed Koch towards crime. The Crown Heights Riots of 1991 made it crystal clear how profoundly flawed Dinkin's attitudes were towards law enforcement. Rudy Giuliani, to his credit took crime seriously and addressed it. It could be argued that his policies saved many African American lives, despite the criticism of Giuliani in African American neghbourhoods. So let's get things straight. The fearful years began well before David Dinkins. Most people trace the years of unbridled lawlessness back to John Lindsay, who was mayor from 1966 to 1973. Mad Magazine did a satire back when he was mayor. In the satire, the college radicals were angry at him for giving them everything they demanded and thereby depriving them of any excuse to protest. So let's keep it real. Things got worse under Dinkins, but they were awful long before Dinkins became mayor. So what is Rudy Giuliani talking about the awful days of the Dinkins administration, when the city was a mess under Koch, Beame and Lindsay? What is he talking about New York City going the way of Detroit? Detroit was known for having African American mayors. They are also famous for high crime . So what is Rudy Giuliani hinting at? Why didn't Rudy Giuliani talk about Eric Adams, a State Senator and prominent supporter of Bill Thompson? Eric Adams was a police captain for 20 years in the NYPD. Why is he implying that Thompson will bring us back to the Dinkins years? Bill Thompson has served ably as comptroller. Many people hope that he will keep honest crime statistics instead of the deceptively rosy statistics kept under the Bloomberg administration. A friend of mine was campaigning for Bill Thompson in Boro Park, where Rudy Giuliani gave his venomous little talk. He was a chassidic man campaigning based on the issues for a man who happened to be African American. A fearful old lady spit in his face and said, "How could you support a shvartse?" There were some others who fell short of spitting, but still talked about "the shvartse". The Daily News reports as follows on the perspective of Assemblyman Dov Hikind, who represents Boro Park in the New York State Assembly and supports Bill Thompson. Hikind also claims he heard the same Yiddish racial slur this morning when he was campaigning with Thompson after the endorsement. “A lady just said to me, so help me G-d*, she said ‘Some people are upset at you that you endorsed the shvartze. That just happened,” Hikind said. It should be noted that Bill Thompson has at no point invoked racial solidarity to fashion African American supporters into an electoral cornerstone. For the sake of a united New York, he has stuck to the issues. It is Rudy Giuliani who has injected racial undertones into the campaign. I have yet to hear Mayor Bloomberg repudiate Giuliani's remarks. I had a lot of respect for Rudy Giuliani, even after his police chief Bernard Kerik was indicted. I don't even hold it against Rudy Giuliani that his old pal had his bail revoked. But I am very disappointed that Rudy Giuliani used fear tactics against Bill Thompson. It shows that he has fallen quite a bit since his heady days as "America's Mayor". It is one thing to criticise particular policies of a political candidate. If Giuliani would have done this, there I would have no criticism. That is what political debate is. But this is not what Rudy Giuliani did .All he said was".. you know exactly what I’m talking about." No I don't Rudy. I really don't.